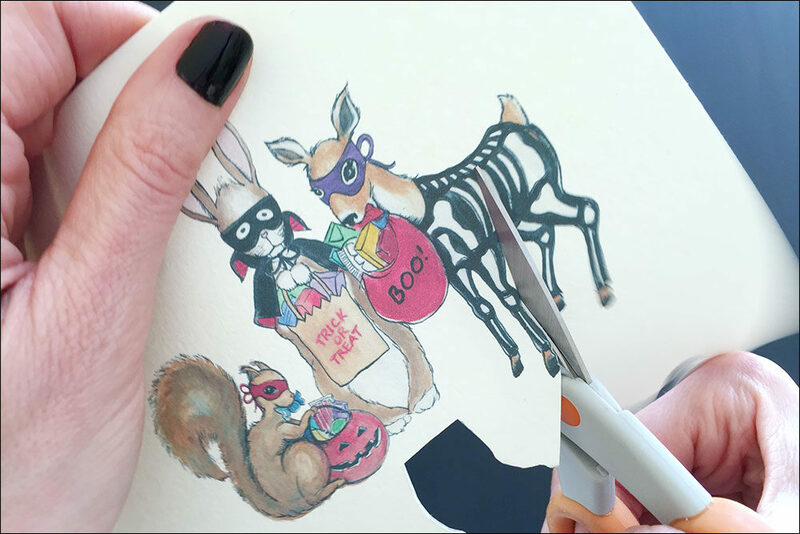 This project is by far one of my all-time favorites: a design for custom party invitations, which included original watercolor illustrations I made special to convey a spooky, but still cute, theme for a Halloween Bunco party (Bunco is a popular social dice game). 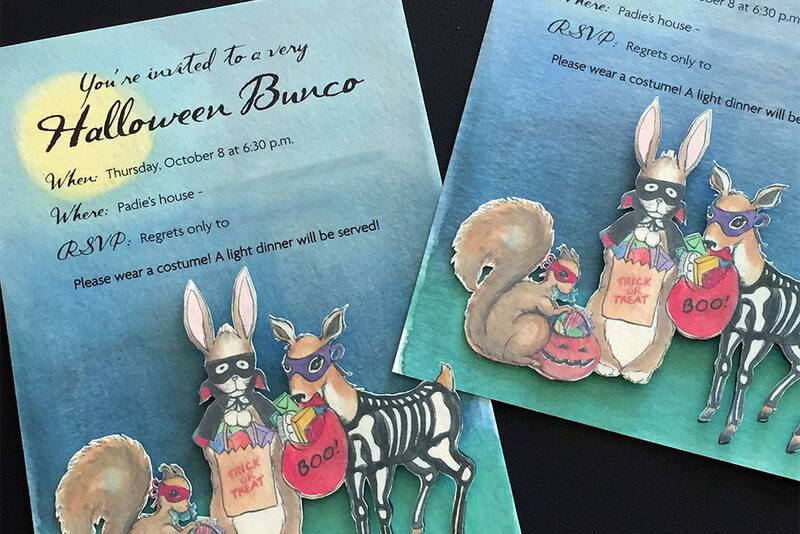 Every year, Padie (my mom), along with the other women in her Bunco group, each host a Bunco party during one particular month. Padie selected October and asked me early in the year if I would work with her to come up with custom party invitations that would not only portray the spooky fun to be had at her Halloween Bunco party and inspire her friends to attend in costume, but also, give everyone a story to remember as part of the custom party invitations experience. We started brainstorming ideas, and it was clear right away that furry and feathered woodland creatures would need to be front and center in the design. Armed with the notes from our meetings, I started sketching characters and researching animals I could work into my drawings. 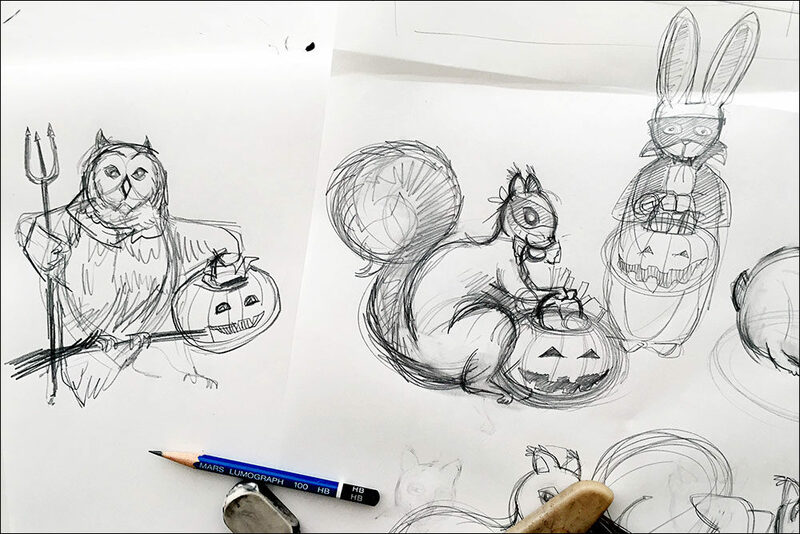 After coming up with several rough pencil sketches of various woodland animals in Halloween costumes and the like, I settled on the cast of characters featured here: a squirrel, a rabbit, a deer and an owl. 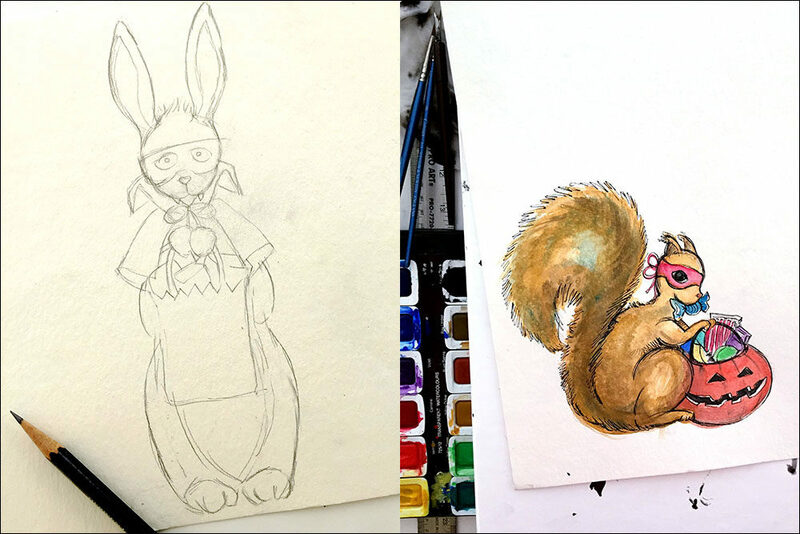 The final pencil drawings complete, I then got to work painting each character in watercolor shades that fit the fall theme. 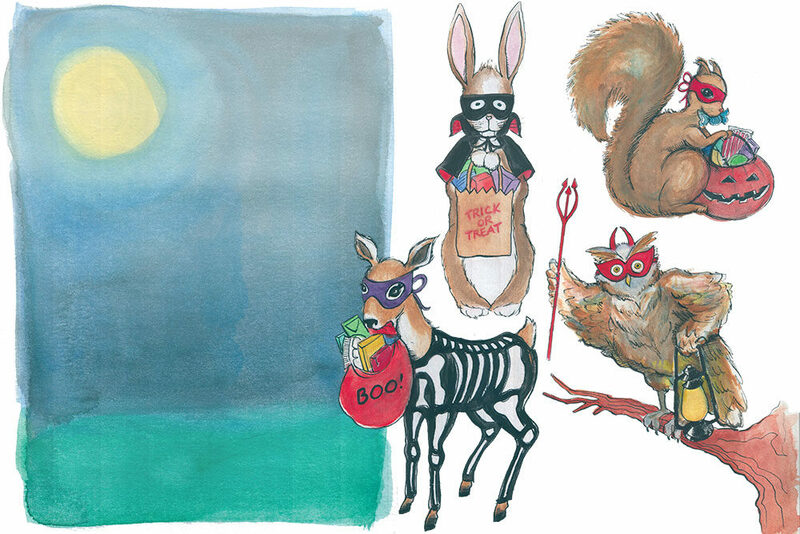 I painted a nighttime background, too, so that our woodland trick-or-treaters would appear on the invitation as part of a finished Halloween scene. After everything was scanned and printed, I printed out another copy of the three main characters, carefully cutting and affixing them by hand to the printed background (using foam squares). 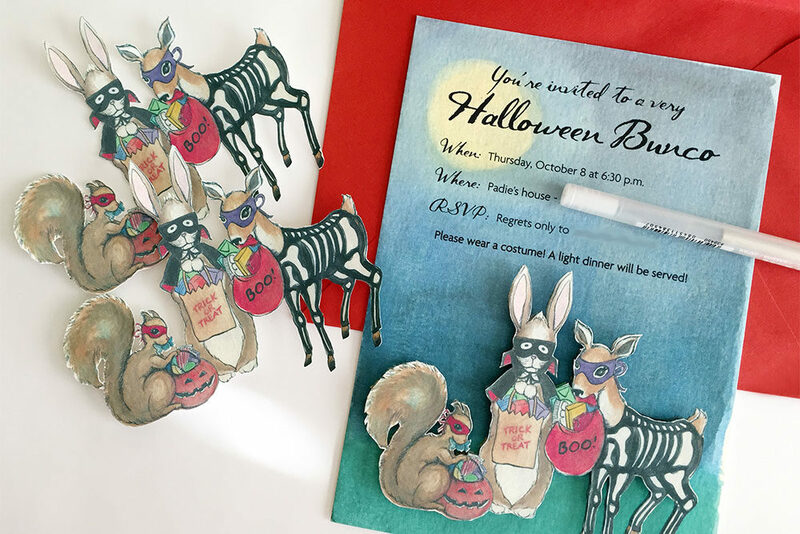 This pop-up technique makes these custom party invitations stand WAY out! 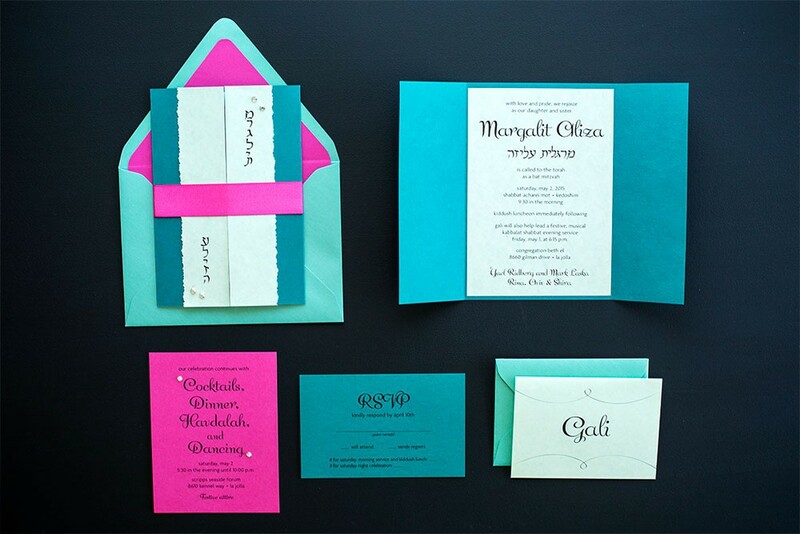 This project is a lovely example of custom Bat Mitzvah invitations. 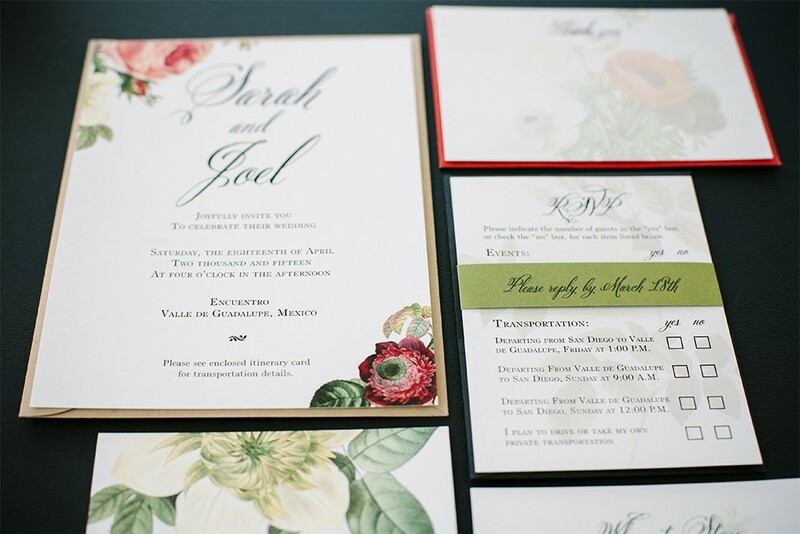 A key element of the invitation is the custom gatefold design, which provides a reveal effect. 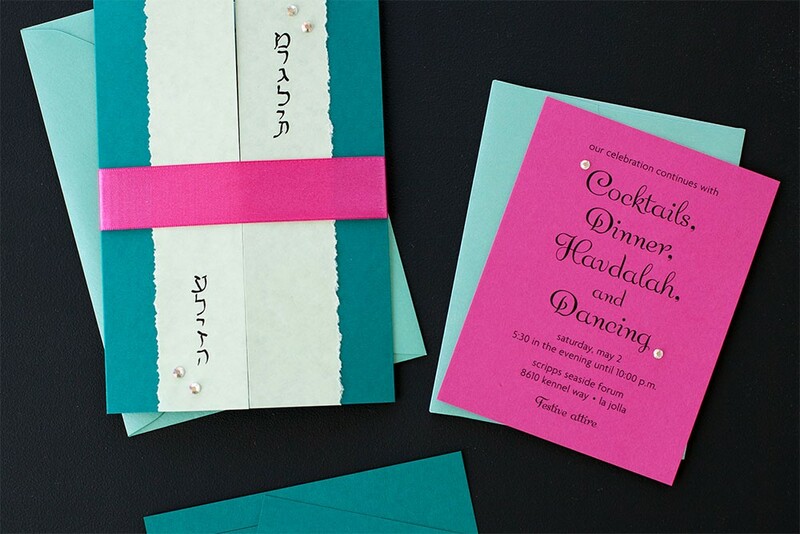 Vibrant, eye-catching colors of pink and teal were chosen, along with a subtle sea-foam green. These guided the choice of paper and ribbon. Satin ribbon, sparkling gems and shimmer envelopes were the finishing touches, once everything had been printed and assembled. 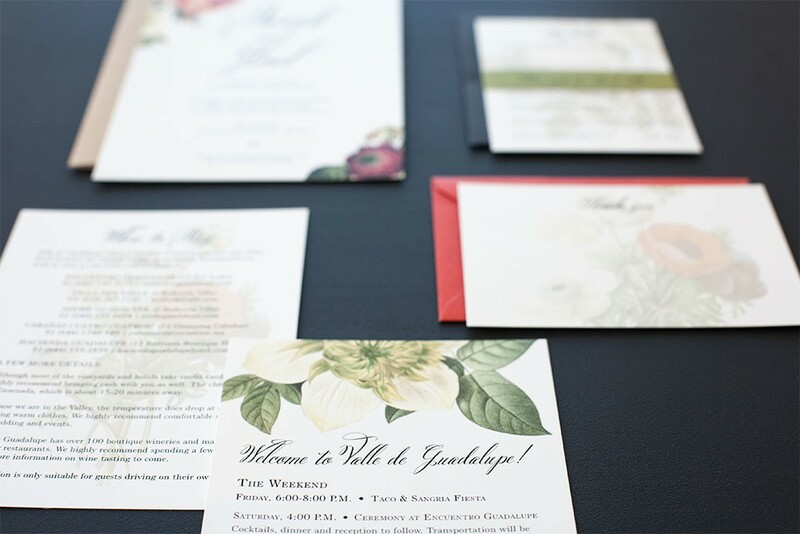 By going over the details with Gali and her mom, Yael, along with event planner Catherine Bachelier Smith of CBS Lifestylist, early on, I was able to clearly visualize how the different elements of the invitation would come together. Along with Gali’s favorite colors, it was also important to include parchment paper in the design, as Gali and Yael wanted the suite to provide a nod to the beauty of the Torah scroll. 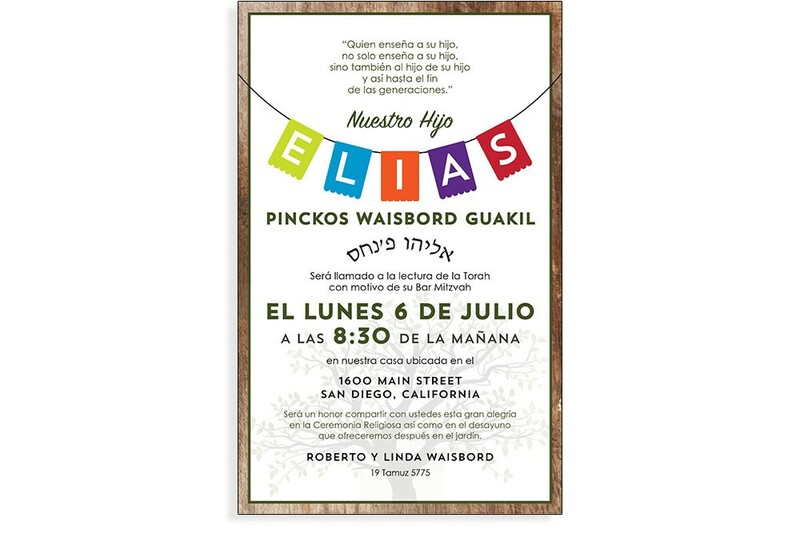 Gali’s grandmother would be providing Gali’s name in Hebrew, by way of her own hand-drawn calligraphy, which I was able to turn into digital art in order to be printed on the parchment paper (for the gatefold flaps). In order to achieve the torn edges effect for the front of the gatefold, I obtained a special ruler to tear each strip of printed parchment paper by hand, so that the individual strips containing Gali’s Hebrew name would appear diagonally aligned in a specific way (as seen in the slideshow above). 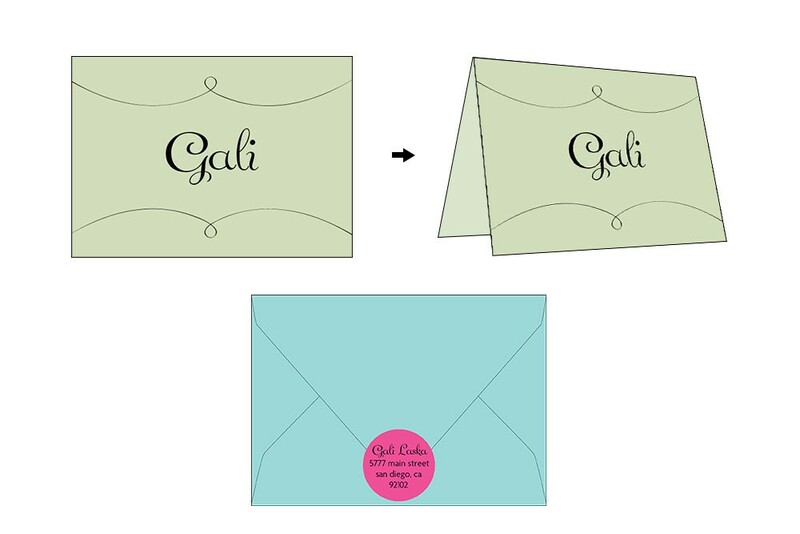 These custom Bat Mitzvah invitations had just the right balance of color, sophistication, sparkle and fun to reflect Gali’s effervescent personality and her special day. 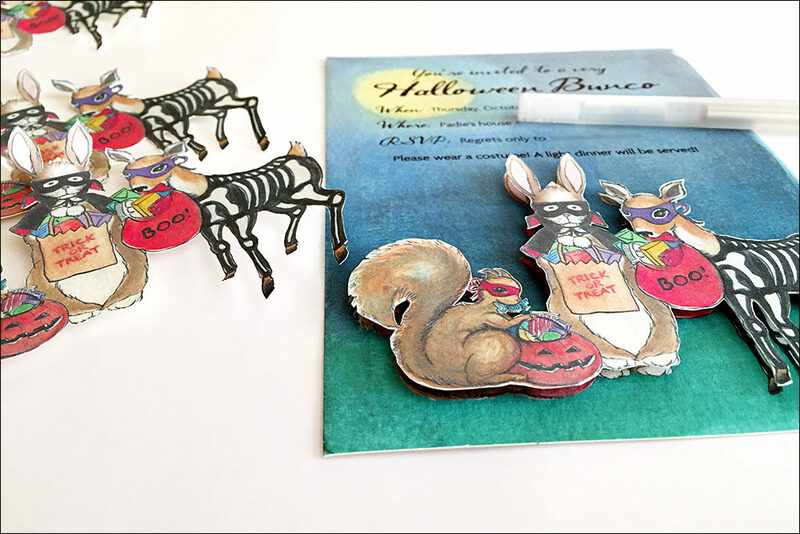 There are four cards included in the suite: invitation card and lined envelope, RSVP postcard, party card and envelope, as well as a folded thank you card and envelope. 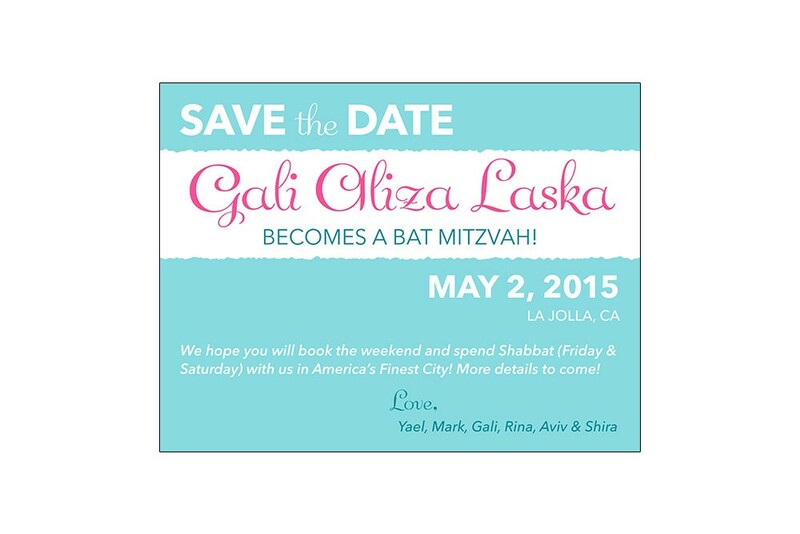 There is also a digital save the date that was sent out electronically. Click here to read about Yael and Gali’s experience working with me. 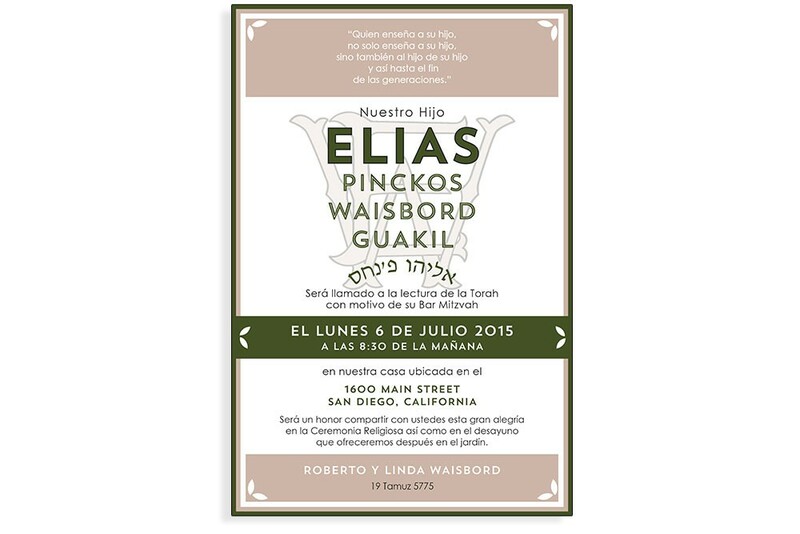 Another recent custom wedding invitation suite I worked on is this one, for easygoing couple Sarah and Joel. 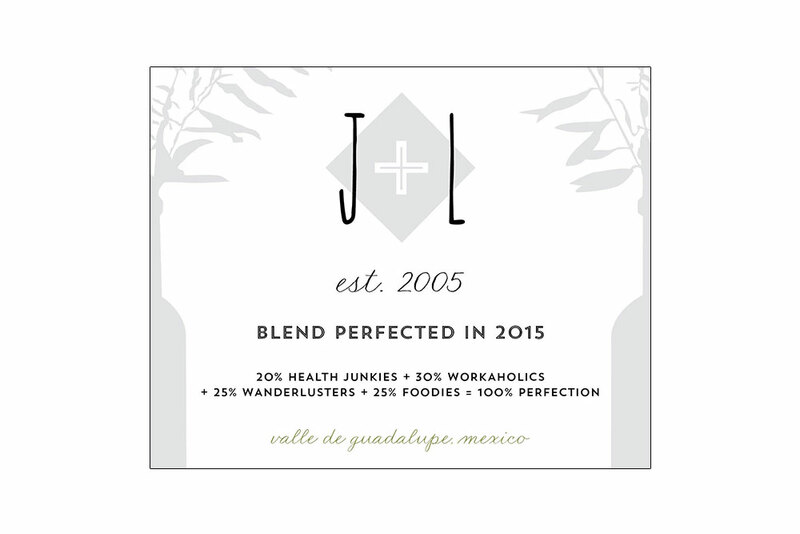 They are an active, young couple that has long enjoyed Southern California and all it has to offer, including the opportunity to hold their wedding ceremony and festivities just across the border in Valle de Guadalupe, Mexico. The special occasion was to take place at Encuentro Guadalupe, known for its modern eco-lofts and resort amenities. I worked mainly with event planner Catherine Bachelier Smith of CBS Lifestylist to come up with invitation ideas that would coincide with the wedding and related events: colorful floral arrangements were to be a common thread and focal point. Knowing the theme, I researched and pulled together corresponding image options, and then used them to create some layouts for the couple to review. 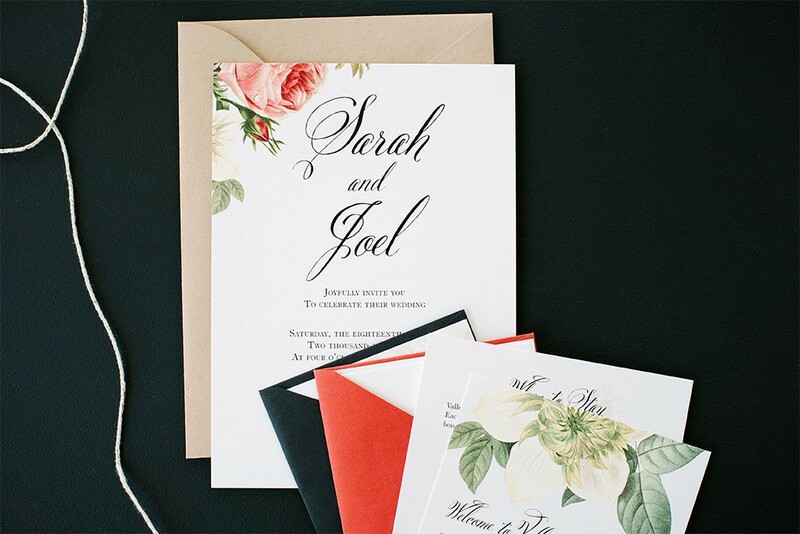 It didn’t take long for Sarah to gravitate toward the invitation suite pictured here. 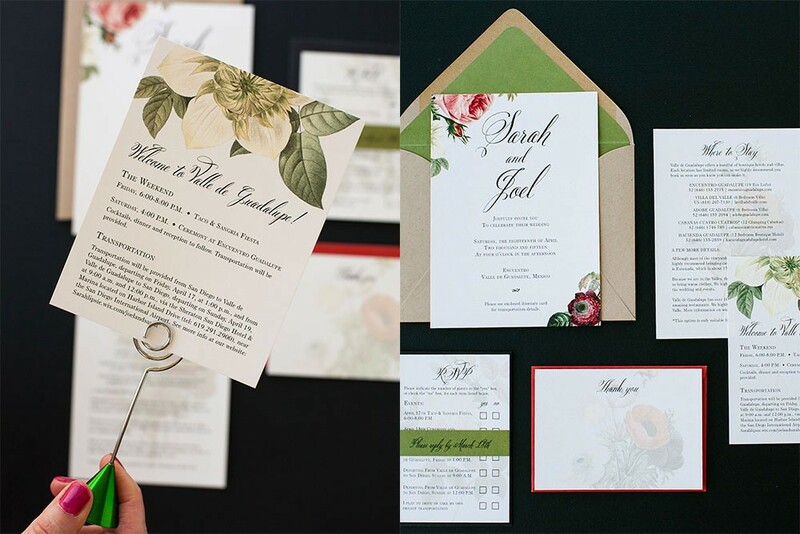 In particular, the colors and variety of the floral images spoke to her and what she had in mind for the wedding, which was to be a celebration of marriage, with nature’s beauty as the joyful backdrop. 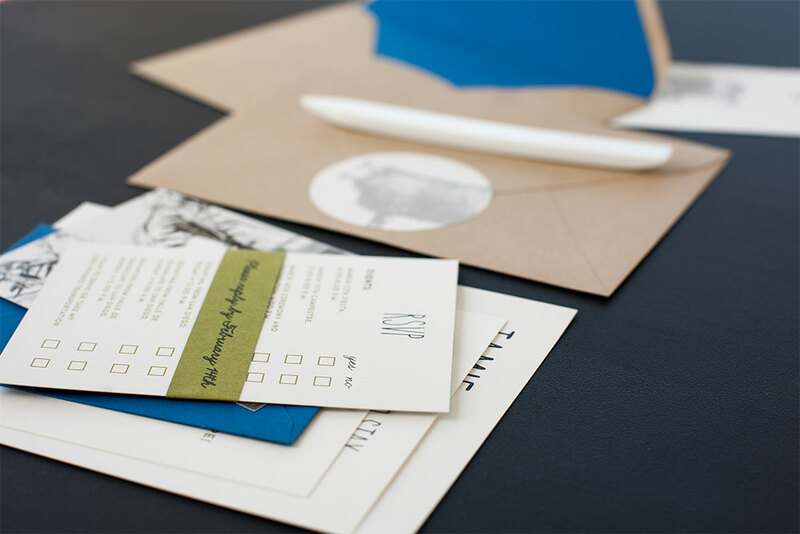 Due to the number of details and special shuttle arrangements that needed to be conveyed to the guests attending, the couple appreciated how seamlessly the invitation suite incorporated all the necessary information, in separate, yet visually corresponding, cards. Much like Jamie and Luke’s invitation suite, we were able to clearly present quite a bit of text, by breaking it up into separate cards that were digestible, one by one, by the recipients. One card led to the next card, each one having a distinct purpose and category related to the event. 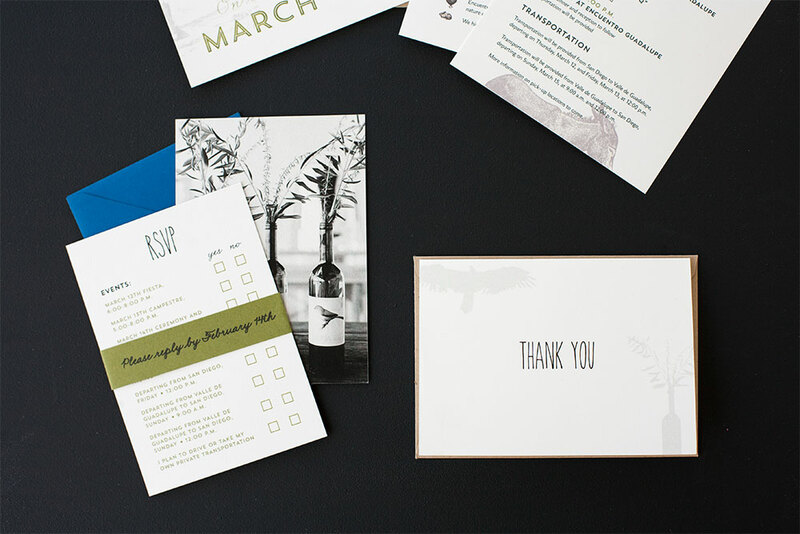 There are five individual cards included in this suite: invitation card and lined envelope; RSVP card and envelope; information (“Where to Stay”) card; itinerary (“Welcome”) card; and flat thank you card and envelope. All designs are pictured in the slideshow above. Click here to read about Sarah’s experience working with me. 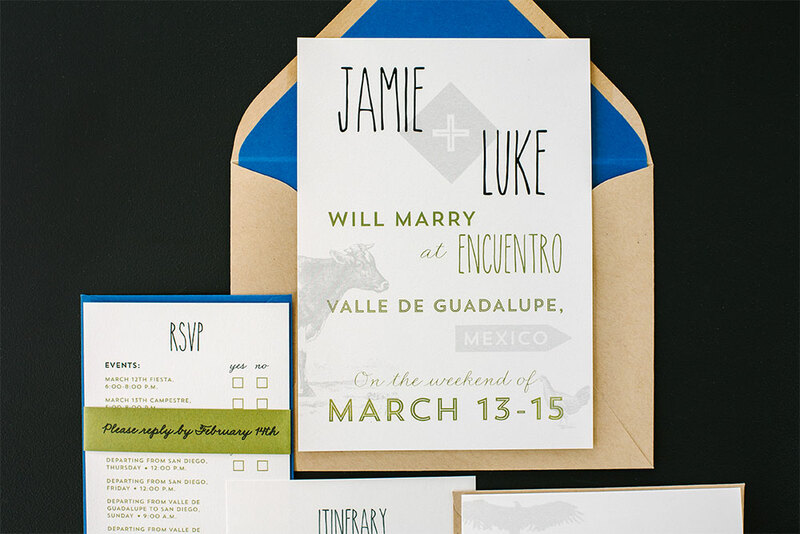 Pictured above is a wedding invitation suite I recently worked on for a couple, Jamie and Luke, getting married in Mexico at Encuentro Guadalupe, home to the concept of “luxury camping.” I worked closely on this suite with the bride-to-be, Jamie Ehrsam, and Catherine Bachelier Smith, of CBS Lifestylist, who helped organize and plan the wedding and festivities. Jamie and Luke, an adventurous couple, travel for a living, scoping out the best event venues and documenting their photos and impressions online (See their website Venuelust). Given the nature of their business, it was no surprise that this was to be a destination wedding! 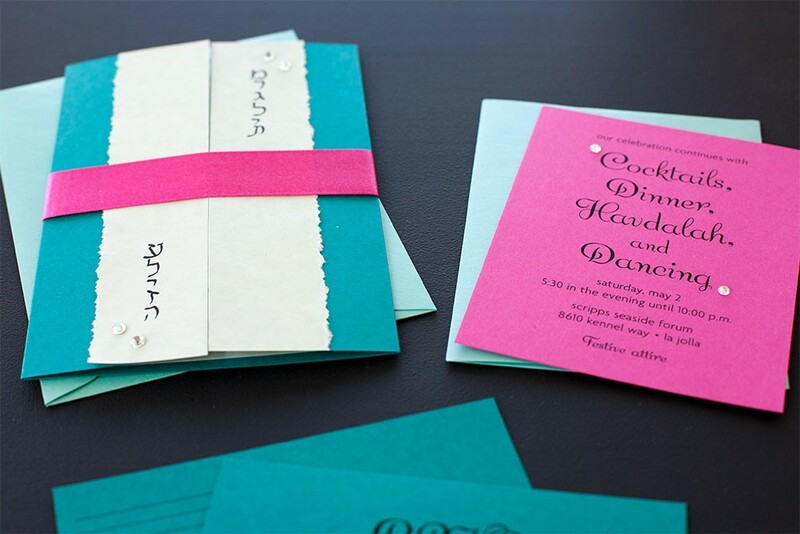 They requested that the invitation suite not look like your typical wedding invitations, but rather, resemble a menu design more than anything else. Food was to be at the heart of the event and resort location, and the suite needed to incorporate that, while striking a balance between being elegant and casual. Once complete, Jamie and Luke were more than a little excited to send out the final product to guests; one reason being that the suite alluded to the tastes and ambience they and their guests would soon be experiencing. 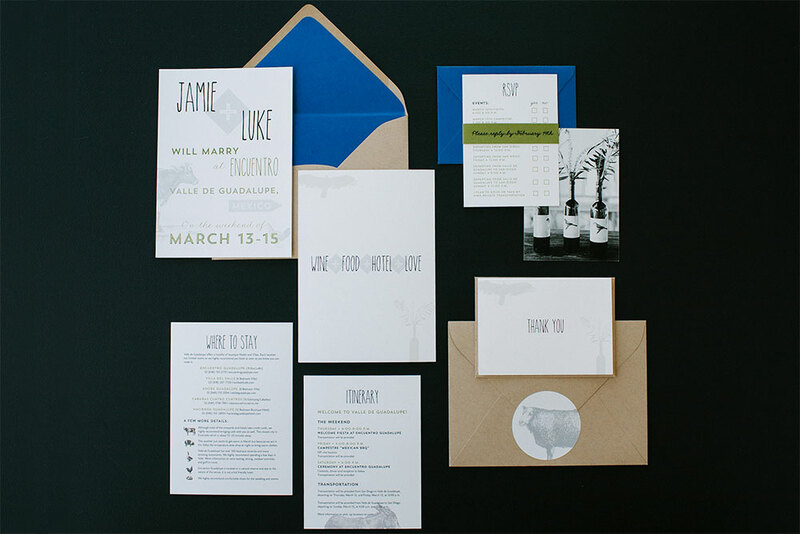 Jamie and Catherine were the best team to collaborate with on this, and I had a great deal of fun discovering ways to match the requested aesthetic, while pointing unmistakably to a very special destination wedding. 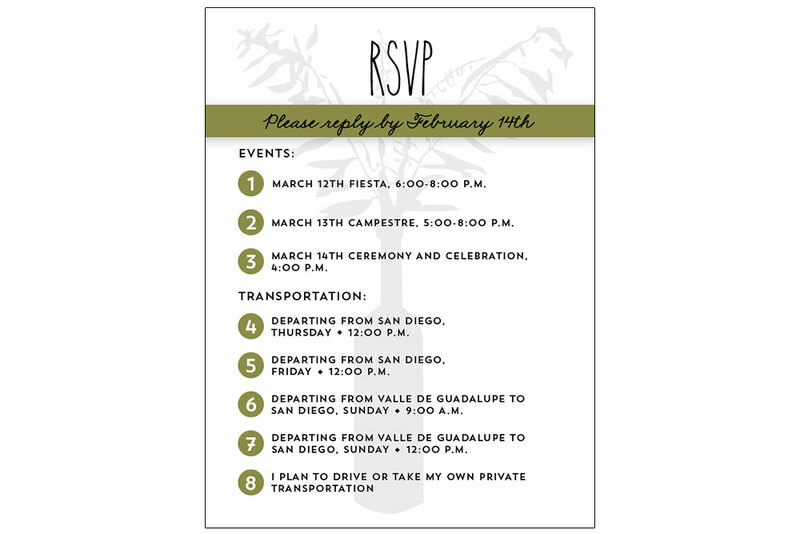 There are five individual cards included in this suite: invitation card and lined envelope, RSVP card and envelope, information (“Where to Stay”) card, itinerary card, as well as folded thank you card and envelope. 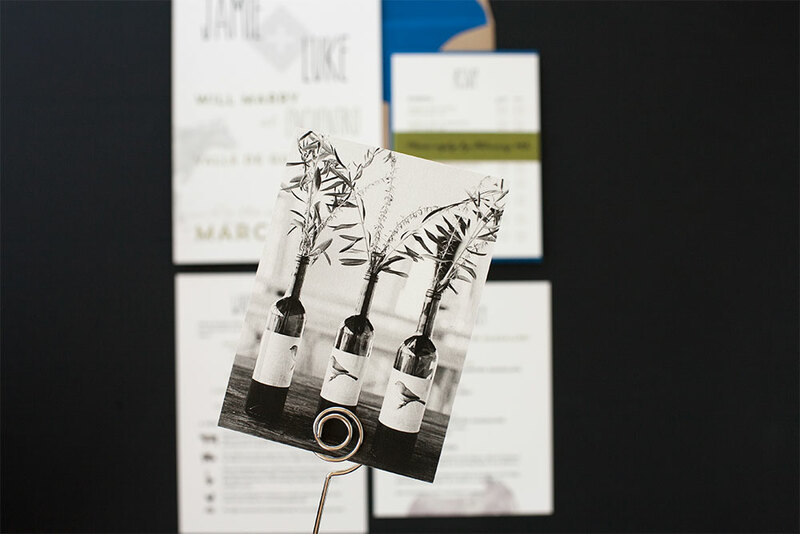 The Invitation and RSVP cards are printed on both sides, using original photography provided by the client, which was also referenced by me in order to create the silhouettes of the wine bottle and soaring bird. I gathered the vintage animal images from various image resources, and made additional items for the client, as needed, including decorative stickers with the vintage animal imagery (to decorate and seal the back flap of the invitation envelope), as well as custom wine labels to adorn bottles of wine intended for wedding guests. All designs are pictured in the slideshow above. Click here to read about Jamie’s experience working with me.